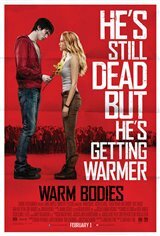 Surprisingly warm and fuzzy...for a zombie flic. It was fun. Funny and had good action as well, very surprised this movie was this good in the same lines as "Zombieland"
Absolutely Fantastic!! It was a great movie!! The story was well thought out and it was very funny. Great movie! Surprisingly entertaining from beginning to end. Very funny and a surprisingly original take on an old concept and zombie movies in general. Love it. Ok I just finished watching this movie and even how cheesy this sounds it made me laugh and cry it was the best movie I have seen in my life I cannot believe it has only 3 stars out of 5 on this site. I am very impressed with this movie!